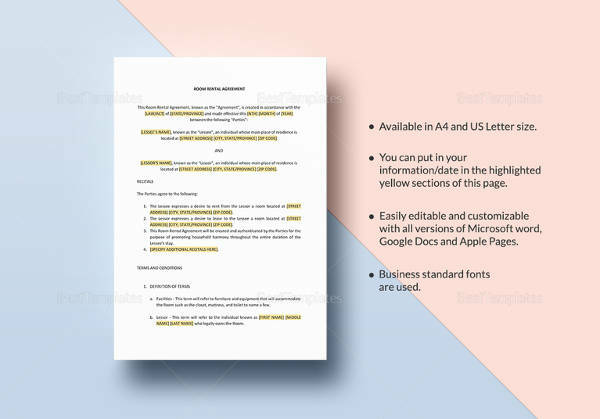 Simple Rental Agreement form is a contract entered between a tenant and landlord for renting out premises for a particular period. This could be either for commercial or non-commercial purposes. There are various categories and forms have been drafted accordingly. 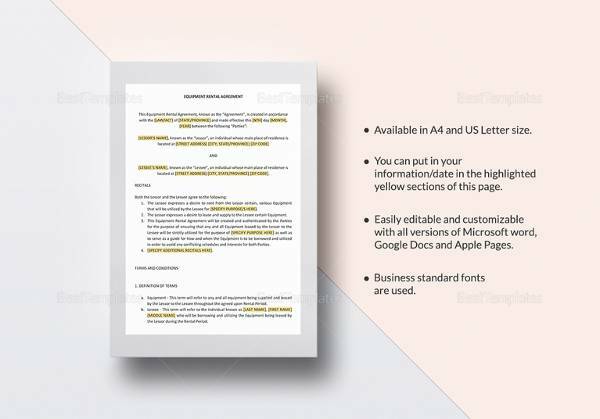 The Sample Agreements are extremely helpful to both the parties and contains all the relevant clauses like rent amount, the period of the lease, mode of payment, security deposit, etc. 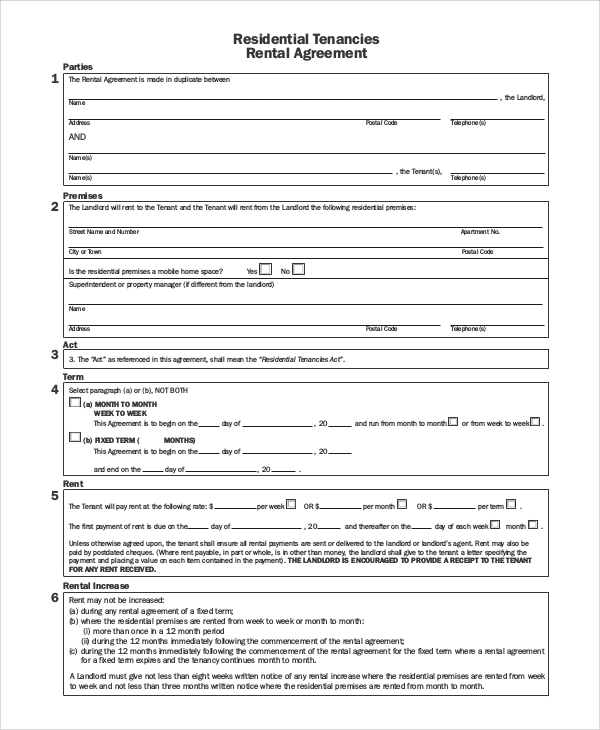 This form gives details about renting the premises for a fixed time with details of rent, mode of payment, security deposit, penalty clause on default and various other terms and conditions. 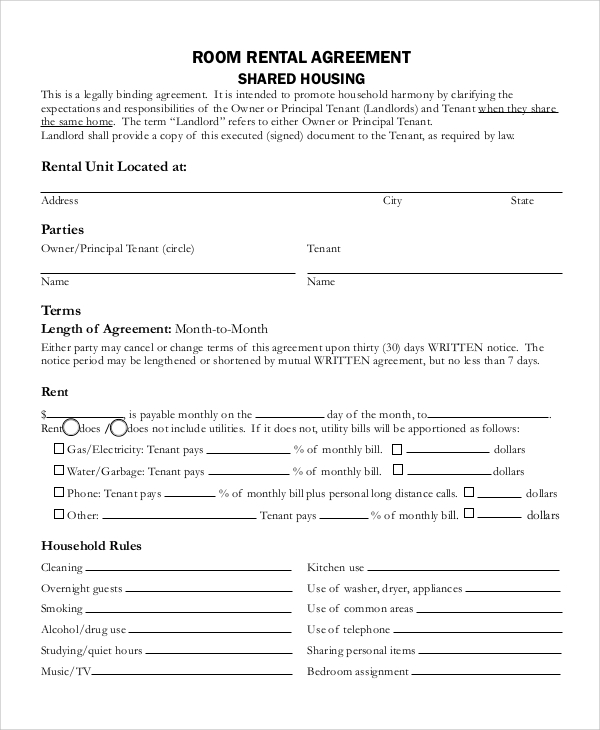 This Sample Room Rental Agreement is entered into when the landlord rents out a room in his home to a tenant. 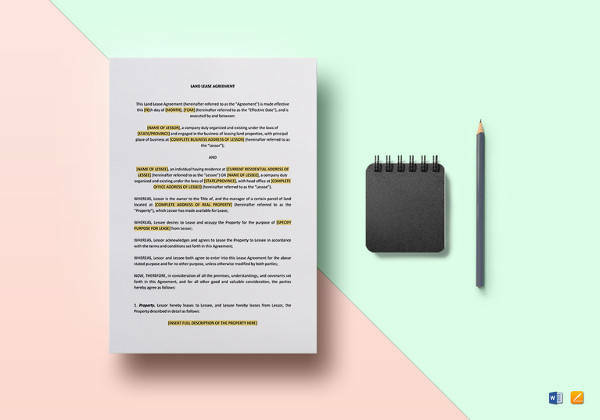 The clauses of such an arrangement usually impose conditions on the tenant relating to cleanliness, late night hours, overnight guests, drug and alcohol use, etc. 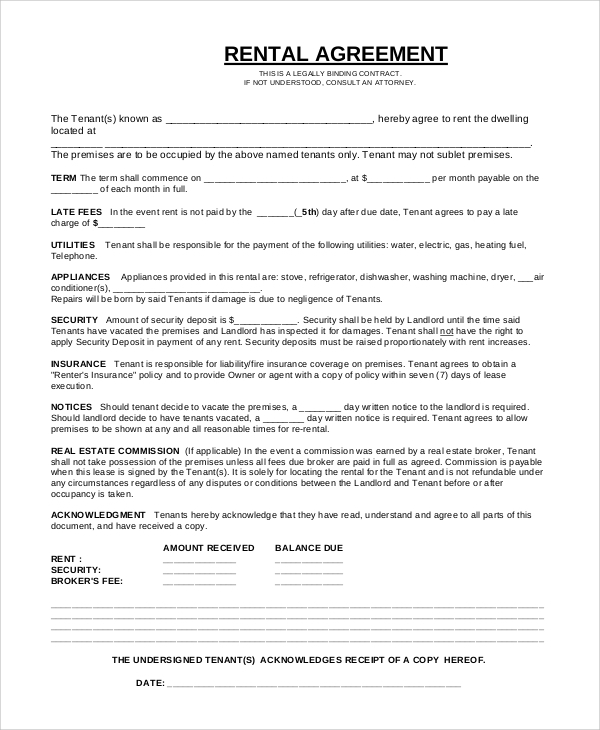 This is a vacation rental agreement, usually for short durations and has specific restrictions imposed on the tenant. 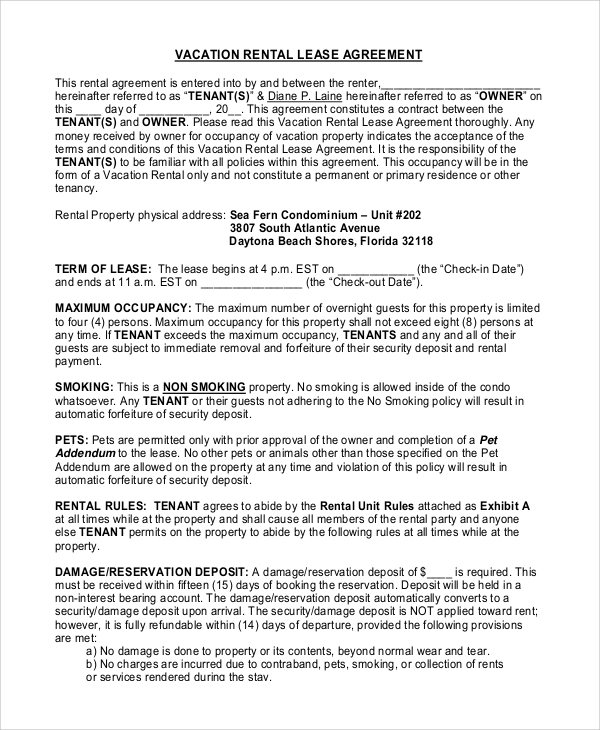 Clauses such as limited guests, no smoking, and permission required for pets etc. 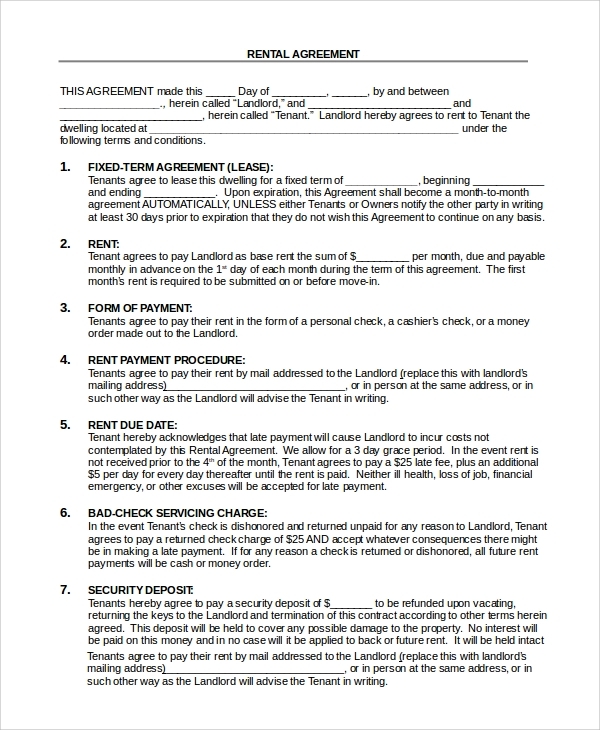 Simple Rental Agreements is used when a landlord and a tenant enter into a mutual understanding for renting premises. 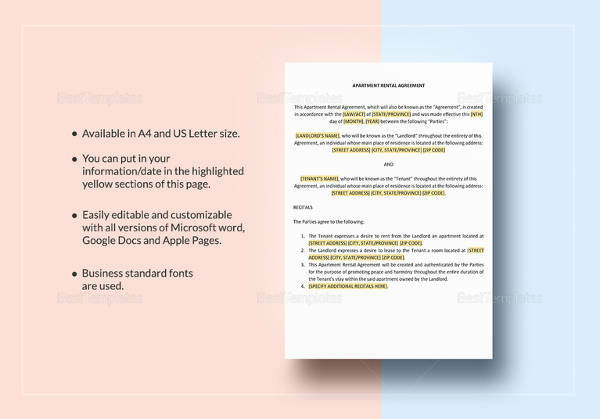 These agreements can be used for commercial, domestic, vacation houses, single rooms attached to a house, etc. 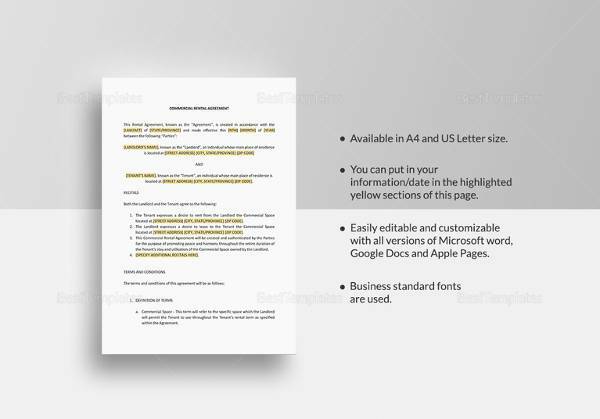 All the relevant clauses have been included, and interests of the landlord and tenant have been taken into consideration. 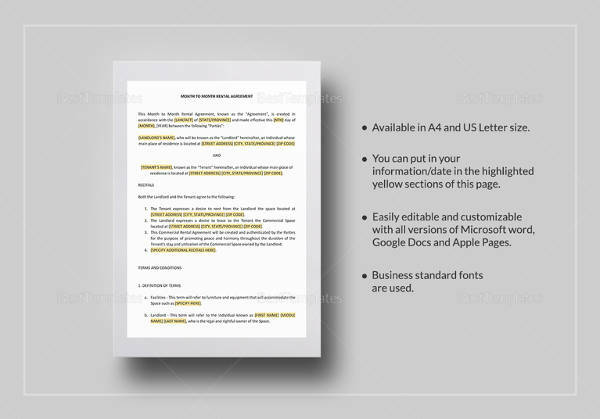 Depending on the type of premises, various categories of agreements are available for use. Each has their rights, and agreements help to preserve those without resorting to legal channels. 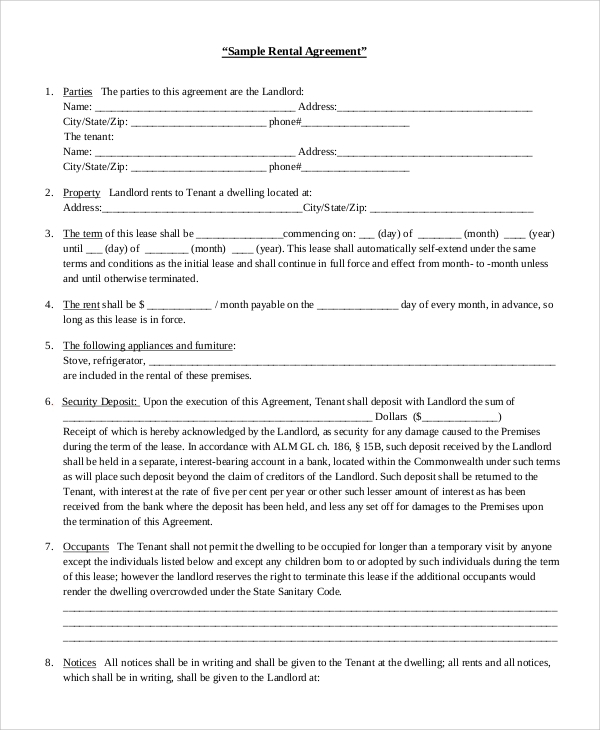 The contract between the tenant and landlord is on a fixed term basis and includes various amenities provided for which a security deposit maybe claimed. There are a few additional benefits extended to the tenant in this case, for which he/she is liable to pay. 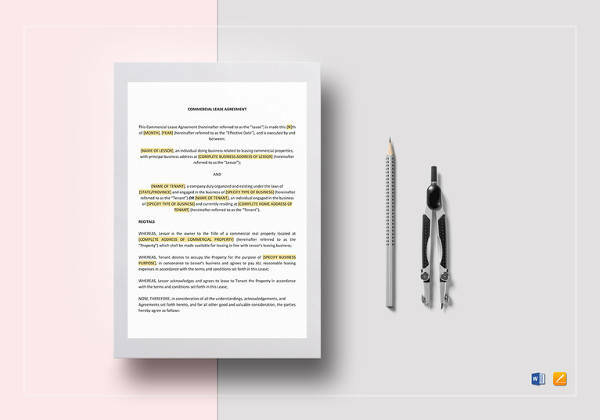 This Sample Residential Rental Agreements between both the parties is specified for a particular state and as such laws could be different in comparison. Clauses drafted are for safeguarding interests of the landlord and tenant. The sole purpose of these agreements is to protect the landlord’s property and the tenant’s rights. They are drafted in such a way that neither can feel vulnerable or insecure. 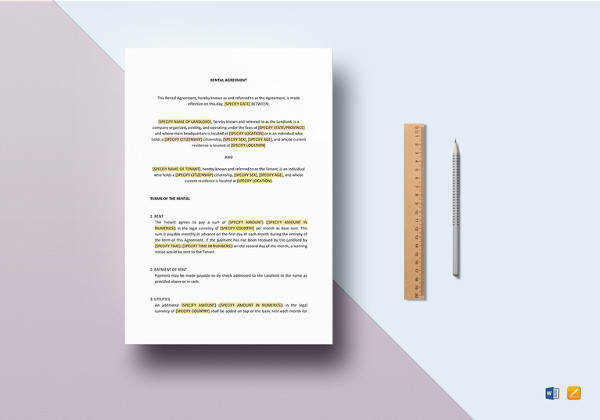 An agreement should ensure that both parties don’t have to resort to legal action to ensure that mentioned clauses are not violated by either. 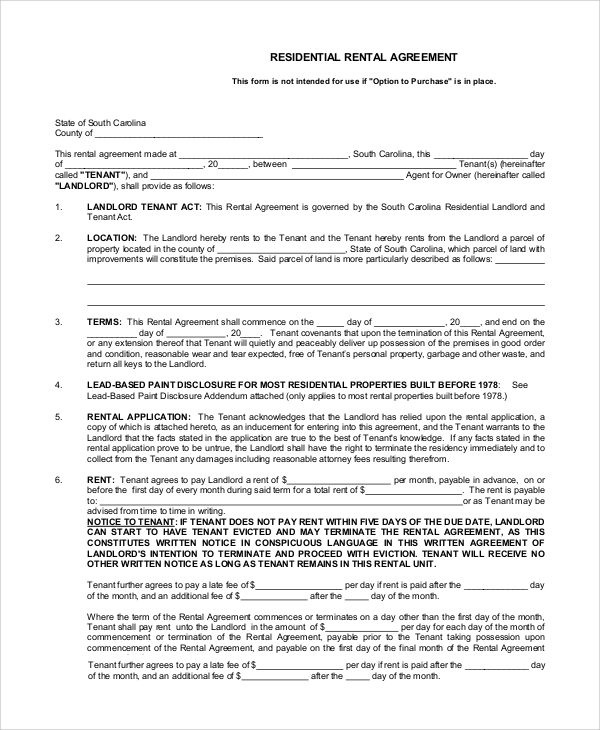 Who Can Use These Agreements? Landlords or owners as may the case is, as well as tenants, comprising of single individuals, families, vacation tourists etc. 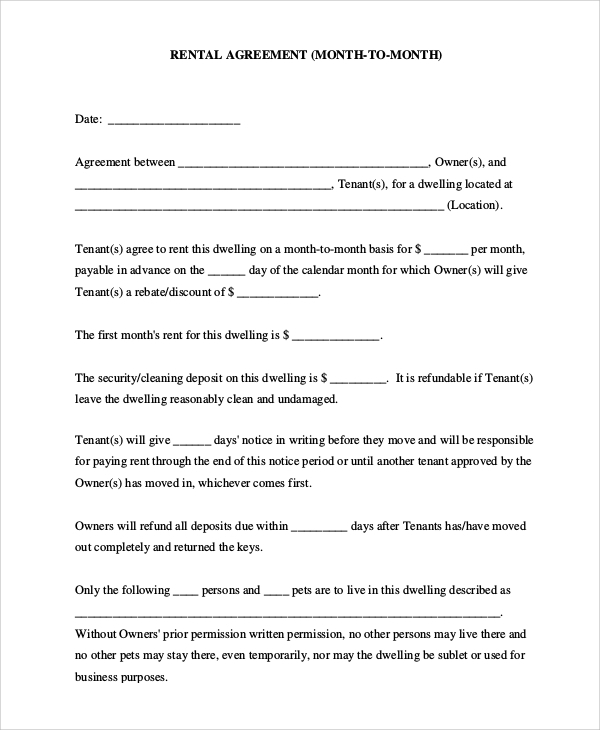 can use these Basic Rental Agreement Samples. Depending on their requirement, rental periods vary. 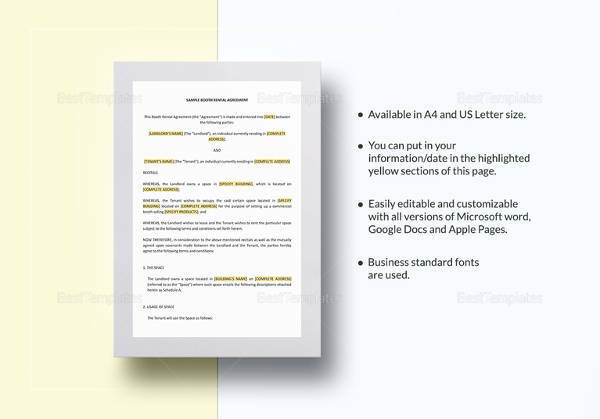 Simple Rental Agreement covers all the basic clauses required in the agreement. Its uses and other relevant information are already given in this report. Various options too are available, and the concerned parties can select depending on the type of accommodation. 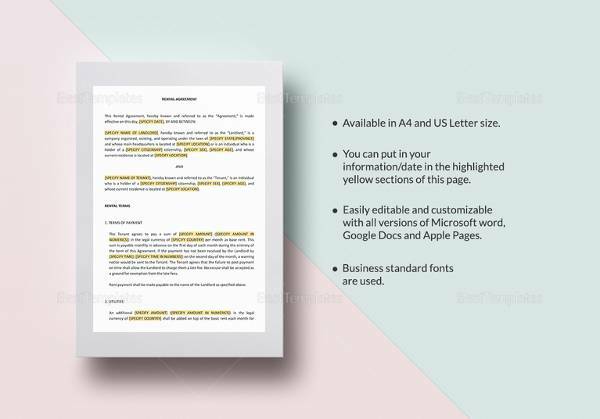 Sample Residential Lease Agreements are tailor made to suit almost all categories and are easy to use and understand.